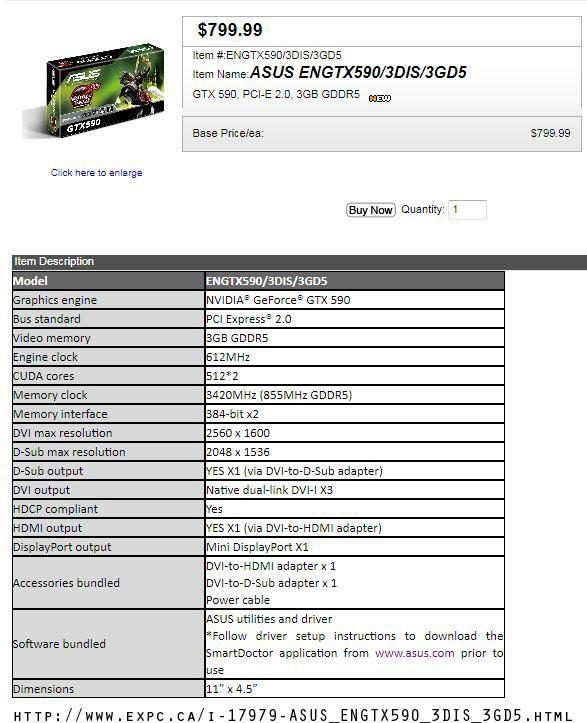 Asus Geforce GTX 590 Leaked, Priced at $799.99. On personal request of Asus Pakistan we are removing this news temporarily because of their NDA. News will be published again when the product will be officially available in market or the content will be back as soon as the NDA is lifted. A Chinese source has recently leaked the Nvidia’s upcoming Dual Chip GPU – Geforce GTX 590. The card is Asus Built and is priced at 799.99$ which is a 100$ more than what the HD6990 is priced at Newegg. This price could be a bit high because Asus variants usually go high for their quality so we can expect a bit cheaper variants later. 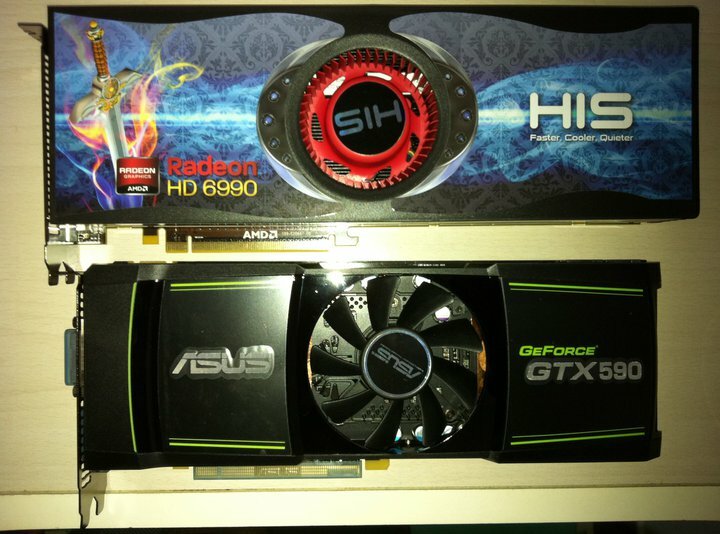 Also you can check out the picture below which clearly shows the card being a couple of inches shorter than the HD 6990 and supposedly it’ll also be quieter than the GTX 580 GPU. The Asus Cooler follows the reference design of the Geforce GTX 590 card. It uses dual vapor chambers each placed upon a GF-110 Core (2 x GTX 580) and cooled by a large fan placed in the middle. The Dual GF-110 Core allows for a total of 1024 Cuda Core (2 x 512) and a 3GB of GDDR5 memory which is a GIG lesser than the rival HD 6990. The Core clock is maintained at 612Mhz while the GDDR5 memory is operated at 855mhz (3420Mhz effective) along a 384bit x 2 memory bandwidth interface. The card is powered with two 8 pin PCI-e connectors, We previously stated that it would use dual 4 pin connectors but that was just a hoax. TDP would be around the 300-450 mark which means a 650W PSU should be sufficient enough to run it. The card comes with 3 x DVI and 1 x HDMI connector and utilized all the Nvidia exclusive features such as PhysX, 3D Vision, 3D stereoscopic, CUDA. Release date of the card is 2 days ahead on 24th March 2011, The reason for the 2 day delay is said to be some driver optimization issue.